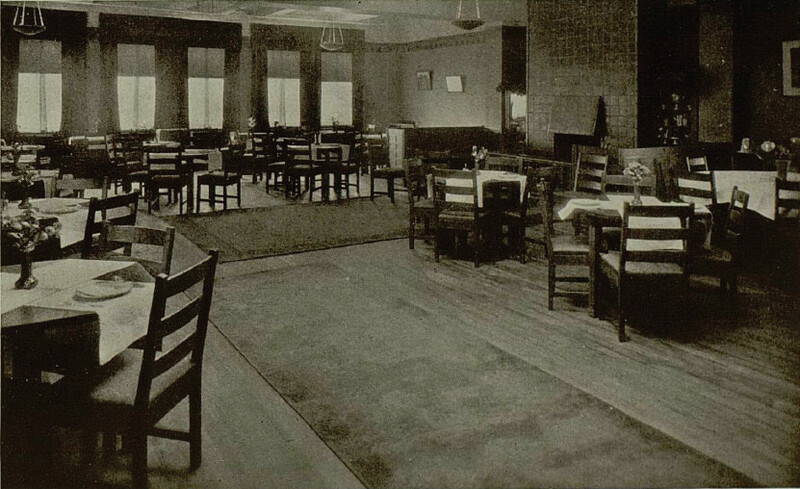 The restaurant operated by Gustav Stickley on the 12th floor of his retail house furnishings store on 39th street in NYC was a brave but brief experiment in pure food, sanitation, and “progressive living.” It opened in May of 1913 and was out of business a few months short of three years later when the entire retail business failed. The restaurant’s ability to attract patronage was undoubtedly limited since it was intended to appeal to the same people who admired Arts & Crafts furniture and house fixtures. This did not include most Americans, particularly new immigrants who populated big cities such as New York. Additionally, restaurants located in stores, even big department stores which can attract hordes of shoppers each day, typically lose money. The restaurant followed the same aesthetic, both in its decor and its approach to food preparation, that defined the Craftsman Workshop’s project generally. The Workshop’s ambitions were captured in the motto which appeared on furniture labels and the restaurant’s china: “Als ik kan.” In its quaint Dutch formulation, it was a pledge to do one’s very best work. 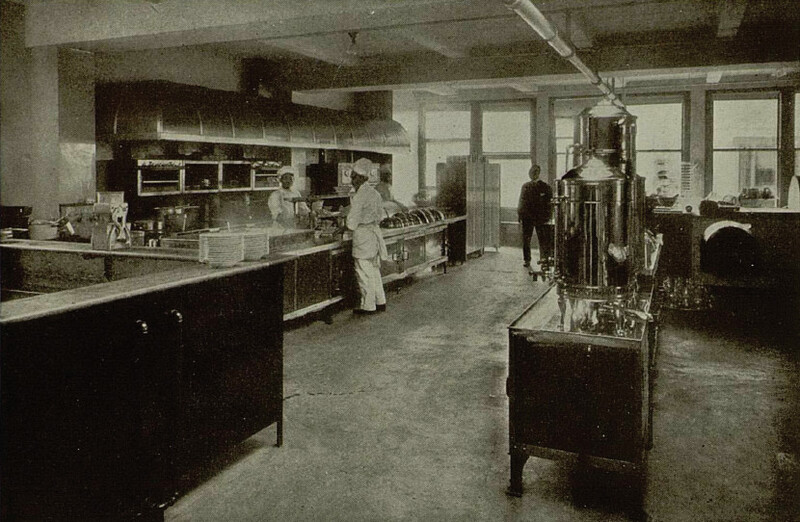 When applied to food this meant pure and fresh ingredients straight from the source, simply prepared by cooks using modern appliances in a pleasant work environment, and consumed slowly in a restful setting. “Style,”whether in house furnishings or a meal, was supposed to emerge organically from an honest approach to materials and workmanship. A 1910 article in the influential Stickley publication The Craftsman identified a type of ideal restaurant, the down-to-earth “marketman’s” café (such as New York’s Smith & McNell or Boston’s Durgin-Park) which used fresh fruit, vegetables, fish, and fowl that had never seen the inside of a factory or cold-storage warehouse. Provisions such as eggs, dairy products, vegetables, and spring water served for lunch[eon], teatime, and dinner at the Craftsman Restaurant were trucked in daily from Stickley’s 600-acre Craftsman Farms in Morris Plains NJ. As food reformer and “real food” proponent Alfred W. McCann argued, the restaurant was a model for the entire industry. 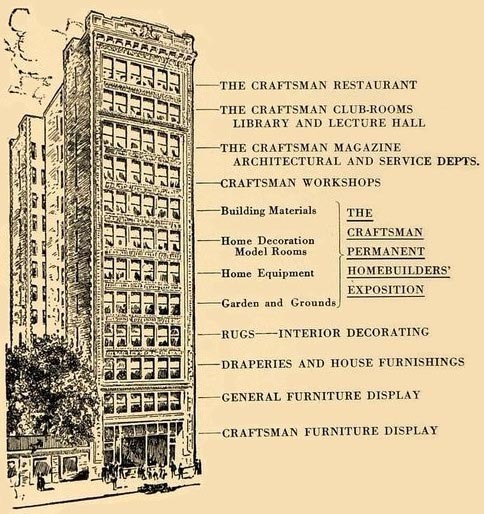 “The legalized chemical preservatives, chemical bleachers, chemical glazes, chemical flavors, inert fillers and extenders, coal tar dyes and grossly impoverished foods, however popular, can find no place on the Craftsman bill-of-fare,” he wrote in 1915. The Craftsman Restaurant was a haven for people of “good taste” wishing to avoid the show-off culture of champagne and loud music exemplified by lobster palaces and cabarets. It was the polar opposite of the garish Café de l’Opera, though ironically each in its own way was a spectacular failure. The Craftsman appealed to patrons such as well-to-do club women and college alumni groups. Shortly before it closed, the restaurant hosted Columbia University’s class of 1902. They enjoyed their dinner but were sorely disappointed to find out that the restaurant served no alcoholic beverages. The dining room was decorated in earth tones: browns, deep reds, oatmeals, and creams. Plates, bowls, and cups were rimmed with a pinecone design. Bread was served in handmade willow baskets. The wood floor was mostly left bare while the tables were covered with criss-crossing Irish linen runners. A focal point of the room was a Germanic-looking hearth covered in Grueby tiles, with a hammered copper hood. In keeping with the subdued decor, quiet and low-key service was accomplished by what one visitor described as “soft-treading little men of Nippon,” while stringed instruments softly played “something familiar from Grieg or [Edward] MacDowell.” This was most definitely not a restaurant for rowdies. The store and restaurant closed early in 1916. In August the entire stock of the Craftsman Workshops store was sold at Gimbels Department Store at reductions of 35% to 50%. My husband grew up in Eastwood, NY (part of Syracuse). He remembers men in the neighborhood working at the “chair factory” which he later realized was Stickley’s. Thanks for the article; we love finding out more about him and his business. Yes, I’d eat there, too, if they add a bit of a wine list. Wow, didn’t know they’d done this. Take the catalog from the 2005 “Arts and Crafts” exhibition of the LA County Museum of Art for decor, furnishings, and table settings, a very good locavore chef, and recreate this place with $millions, and booze. In the right location it’s a goldmine. Kind of the first slow food / local food concept…thanks Jan.
Oh, this is a beautiful old place! I love the Craftsman style. There are times that I wish we could go back in time and see life as it was then. I know I’d visit this restaurant! A wonderfully interesting history here.